The father lived on the sixth-floor of the building in northern Paris, the building’s concierge told BFMTV. 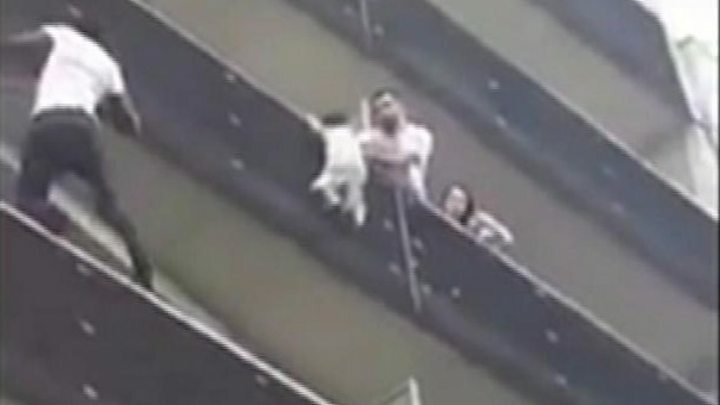 But the neighbour told Le Parisien newspaper that he was holding on to the boy’s hand but could not pull him up because of a divider separating the two balconies. The French offence of failing in one’s legal duty as a parent can be punished by two years in prison and a fine of €30,000 ($35,000; £26,000). The 22-year-old left the town of Yaguine in south-western Mali as a teenager in 2013. He took the migrant route across the Sahara desert through Burkina Faso, Niger and Libya, and crossed the Mediterranean to Italy in 2014 at the second attempt after having once been intercepted at sea by police. “I had no means to live and no-one to help me,” Mr Gassama told Mr Macron. During his journey, he spent a year working in Libya, where migrants are frequently exploited and even enslaved by gangs. “I suffered a lot. We were caught and beaten but I did not lose hope,” he said. He told Mr Macron that he had travelled to France because he did not know anyone in Italy and his brother had been living in France for many years. In Paris he worked cash-in-hand on building sites and lived in a hostel in the western suburb of Montreuil – known as “little Bamako” because of its large Malian population. He had not applied for asylum and was living illegally in France. In the hostel, he has been sharing a room with relatives and sleeping on a mattress on the floor. On Monday Mr Gassama met another Malian migrant given French citizenship for his acts of courage – Lassana Bathily, who helped customers in a Jewish supermarket in western Paris hide when a supporter of the Islamic State group took hostages there in 2015. Mr Bathily, who has written a book about his experience, said Mr Gassama was “still in a state of emotion” following his daring rescue. “He asked me about my experience and what I went through during the attack to get some advice,” Mr Bathily told BFMTV. “We weren’t in it for anything but afterwards everyone was interested in us. On Tuesday Mr Gassama received French residency, a first step towards citizenship. He also signed a contract for an internship with the Paris fire service.